Hotel Café Royal has launched 10 new cocktails in collaboration with Parfums Givenchy that celebrate L’Atelier de Givenchy fragrances and Iris Harmonique, the latest perfume in the collection. The L’Atelier de Givenchy cocktails will be available in Hotel Café Royal’s Green Bar from 22 August to 30 September 2016. 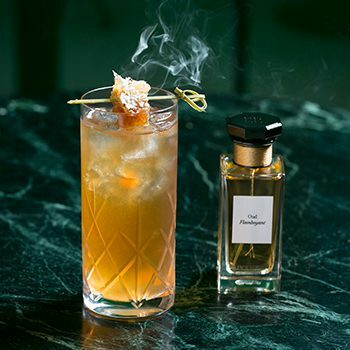 The range follows the initial Atelier cocktail collection, which launched at Hotel Cafe Royal last year. Developed by bar manager Derren King, the 10 cocktails have been designed to reflect the creations within the L’Atelier de Givenchy fragrance collection in keeping with the Green Bar’s celebration of botanicals. King has worked closely with Givenchy, using the brand’s detailed perfume notes to create a collection of drinks that range from fresh, floral and summery concoctions, to headier, full-bodied cocktails, all paired with a selection of distinctive garnishes and glassware. Highlighting the strong link between scent and taste, the new fragrances will be kept behind the bar for guests to experience before choosing their preferred cocktail from the list. The bartenders will explain the fragrances within each cocktail, and will serve them alongside scented buttons created by Givenchy. The latest fragrance in the collection, Iris Harmonique, is embodied by a cocktail of the same name which incorporates key elements of the perfume notes. Infusing the vodka in-house, king has created a concoction of coconut-infused Ketel One vodka, kumquat liqueur and lemon zest. All cocktails are priced at £15 each and are also available alcohol-free. Click through to see the new, exclusive L’Atelier de Givenchy collection of cocktails and their ingredients.